If you need an experienced criminal defense attorney in Delta, Colorado, do not hesitate to schedule a consultation with a lawyer at LunaLaw. Whether your matter is criminal, DUI or family law, we can provide the legal insight you need. As a former prosecutor, law firm founder Brandon Luna handled more than 5,000 felonies, misdemeanors, DUI charges and traffic violations. Armed with intricate knowledge of the strategies and tactics that prosecutors use, attorney Luna can carefully prepare a strong defense for his clients. 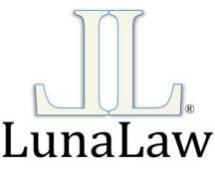 This experience, knowledge and insight are directly beneficial to clients at LunaLaw. The attorneys at our law firm can provide honest answers no matter the charge you are facing. We strive to educate our clients on the legal process, the potential consequences and challenges that must be faced along the way. While we focus substantial resources on defending clients facing criminal or DUI matters, we can also provide skilled representation in a wide range of family law areas. If you are facing a divorce, child support or visitation dispute, it is crucial that you have an experienced attorney on your side. If you live on the Western Slope of Colorado and seek knowledgeable, dedicated and passionate criminal defense representation, please contact LunaLaw today.